Hyderabad, 22 April 2018: Mahindra Electric has announced a collaboration with Meru to deploy a fleet of eVeritos, its all-electric sedan for a pilot EV project in Hyderabad. Based on the success of the pilot, the project will be replicated in other cities as well. The adoption of EV technology by a large fleet operator will make EVs more accessible to a larger urban population and lead the way towards sustainable transportation in urban cities. Over the next 4 years, Meru intends to move a major part of their fleet to EVs. Since its launch in 2007, Meru has pioneered the concept of tech enabled ride hailing services and served over 12 million customers in 24 cities. Meru service is available for both local and outstation destinations, for point to point travel or for hourly rental packages through its Android and iOS mobile apps. With 5+ million downloads, website and call center, it is the only government licensed cab service in India which is official partner of all the private airports in the country. The electric vehicle ecosystem is growing at a rapid pace and will soon bridge the viability gap, bring down air pollution levels and reflect massive savings in energy bills. 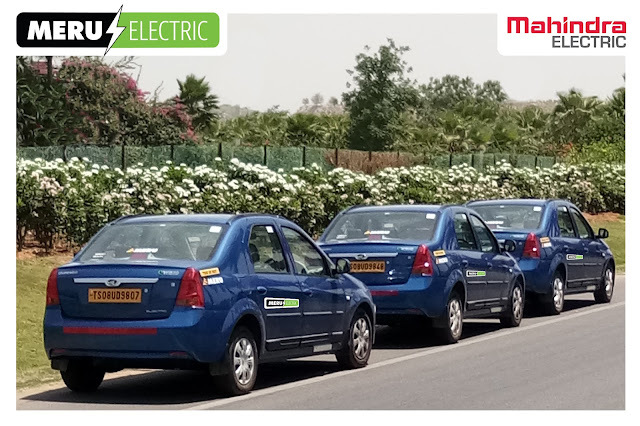 The Indian government is also actively promoting adoption of EVs through the National Electric Mobility Mission and other initiatives of various ministries.